I have a feeling of accomplishment today. 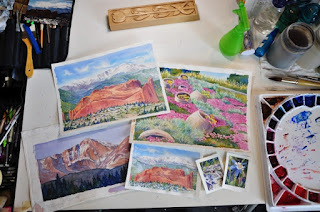 With the classes I am teaching, commissions, and paintings I want to paint, I have a pile up of unfinished paintings in my studio. I hate the feeling of having projects laying around. So, today I set about getting some of them finished. The photo shows some of the completed paintings. Unfortunately, I still have about 8 more to go! Hopefully, I will find some more time this weekend. I still need to complete the painting I did in the John Salminen workshop last August. I have a band painting drawing ready to go, but I have told myself to wait and clear some old paintings out first. It is so hard to be disciplined sometimes. This is one of my miniature paintings. It will do double duty as a color study for a class demonstration and I will frame it and place it at Arati Gallery for sale. I really like painting columbines. They are the Colorado State flower and they are beautiful. My miniatures are 2"x3" or 2 1/2"x3 1/2" and I frame them with mini frames. They are like little framed jewels. I admire all of your many accomplishments. Thank you for taking the time out of your busy day to become the first follower on my new blog and for adding mine to your blog list. I really appreciate it. Now all I need to do is gain some inspiration to paint from you. I look forward to reading about and seeing your new work! Thanks for all of your comments and feedback.